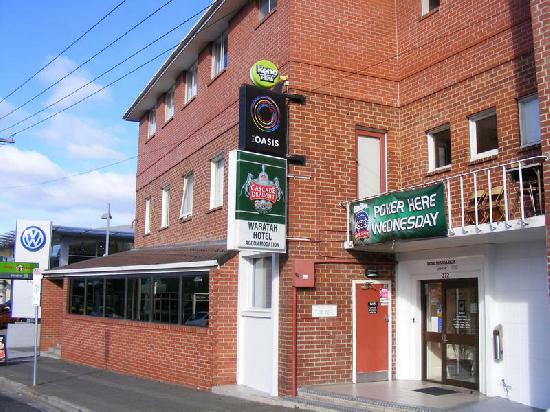 The Waratah Hotel offers clean, comfortable, affordable accommodation in the heart of the vibrant Hobart CBD within easy reach of the many Hobart attractions. This delightful, modern and spacious hotel accommodation is ideal for the budget conscious backpacker looking for hostel accommodation with extra privacy & luxury, holiday makers looking for centrally located B&B accommodation & corporate business traveller requiring affordable accommodation in the heart of the Hobart CBD. All types of travellers can take advantage of the discount accommodation at the The Waratah Hotel, as well as the range of modern amenities including lounge bar, direct internet access, free car parking, guest laundry, restaurant and daily housekeeping. Hobart's only 24-hour bottle shop operates at the rear of the hotel. Further guest facilities and services include daily housekeeping, tours desk, bar / lounge, guest laundry, dry cleaning / laundry service and FREE onsite car parking. But the best part of staying at The Waratah Hotel is the free, hot cooked breakfast each morning. What a way to start the day!. Nearby Attractions : Hobart is packed with various attractions from museums and historical sites to tours by bus or boat and has an enormous variety of restaurants and bars. For the adventurous, there are many nature-oriented attractions as well as activities such as mountain biking down the 1200m Mount Wellington that looms above the city. Double And Single Hotel Room : Sleeps up to 3 guests on 1 Double Bed And 1 Single Bed. Family Hotel Room - 1 D + 4 S : Sleeps up to 6 guests on 1 Double Bed And 4 Single Beds. Quad Hotel Room : Sleeps up to 4 guests on 4 Single Beds. Single Hotel Room : Sleeps up to 1 guests on 1 Single Bed. Triple Hotel Room : Sleeps up to 3 guests on 3 Single Beds. Twin Single Hotel Room : Sleeps up to 2 guests on 2 Single Beds.